Memory pillows are a nice way to remember a loved one. 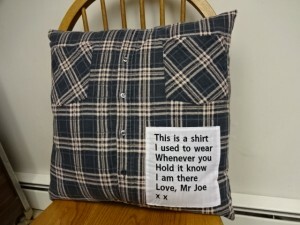 If you have a flannel shirt, for instance, I can make a pillow cover out of it with a saying to remember that person. Please see the picture of a memory pillow cover for an idea of what can be said. You will have to provide the shirt or whatever, of course.